Premature greying becoming common nowadays which happen due to many causes of grey hair. Most people who are dealing with it always having a tension that how to overcome it. These people mainly suffer from a psychological disturbance both men and women which decreases their self-esteem and often a problem with a socio-cultural adjustment. Today various strategies have been developed to prevent hair greying such as hair dye and colouring. 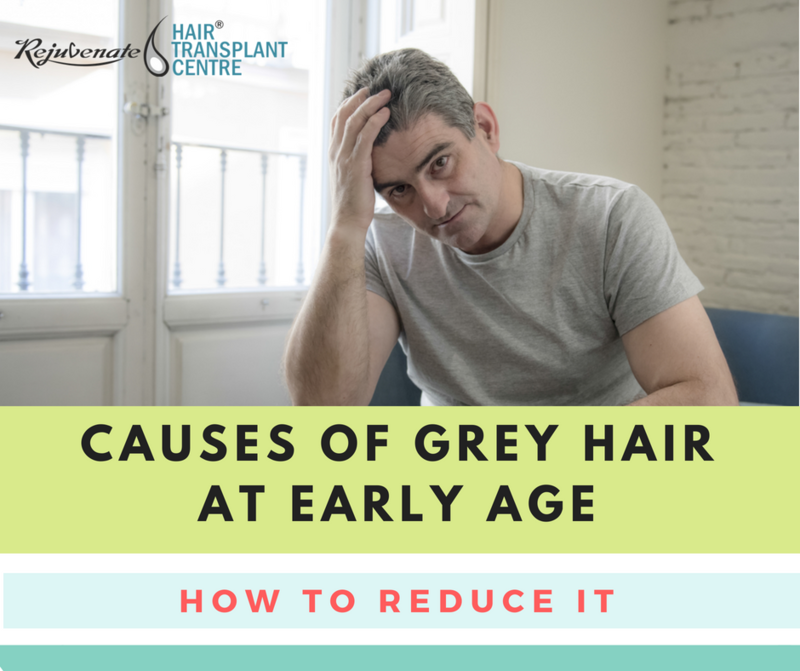 However, hair grey is one of the most common and obvious signs of ageing and it has commonly happened after the age of 40. But in this modern lifestyle hair greying is one of the most important factors that make people look older. Numerous studies have been conducted to understand the mechanisms of hair greying. But there is currently no proven method which can reverse hair greying. The main cause is still unknown but research indicates that there are many risk factors which cause grey hair in early age. It includes hereditary, vitamin deficiency, smoking, excessive intake of tea or coffee, faulty diet, Alopecia and hormonal imbalance. Family History – One of the most important factors which contribute premature greying almost entirely due to genetics. In a recent research report, it found that the gene helps in regulating and producing the melanin pigment which gives colour to hair. As melanin is also responsible for eye and skin colour. So when and how much melanin production in the body this will be determined by genetics. Smoking – Many clinical trials show that the most common causes of prematurely grey hair are smoking and usage of tobacco. Cigarette smoking is one of the big causes of many diseases. According to a study in the journal Science News, smokers are 4 times more likely affected in comparison to nonsmokers, no matter how old they are. Smoke damage the little colour sacs in each hair follicle and make it even worse by lead to baldness. The mechanisms behind smoking cause grey hair are incompletely understood. It indicates that smoking may be associated with a reactive oxygen species which leads to increased oxidative stress and this will damage the melanin-producing cells. Diet – Diet always plays a major role in the development of any disorder. Long-term malnutrition can cause biochemical imbalances which leads to grey hair. Eating an unhealthy diet doesn’t just prevent from getting nutrition in the body but also increase the slowdown in healthy cells. To increase the intake of vitamins, Iron, protein and minerals. They all have antioxidants, which clear the replace the damaged cell from a healthy cell. It is found in various foods such as fruits, vegetables, green tea and many others. The nutrients not only help in minimizing the grey hair but also improve the circulation of the scalp. Medical Disorder – Certain disorders like vitiligo and tuberous sclerosis may cause grey hair. As vitiligo is a skin problem which is related to melanin.Many children from childhood face thyroid problem which is also the reason behind grey hair. To get rid of grey hair you really need to change some lifestyle. In this process, it also changes your usual habit that you are performing now. Started Eating right food – You need to understand that no amount of priced product can compensate the balanced food. So always feed your hair with good nutrients. A diet with vitamin A, C and E are particularly know to slow down the grey hair. As it also strengthens the hair follicle which helps to make it healthy. Quit Smoking now – Smoking always increases the risk of grey hair. Many research shows that if any person unable to quit smoking then the person unable to bring back their black hair. Even at the certain age period if you quit smoking then also reverse is not possible. Check your hormonal balance – It is also the reason for grey hair. When the endocrine system releases the hormones in a proper manner then it is good but a small imbalance can distract the overall body balance. It is also proven that hormonal problem can trigger hair greying. So it is important to take a proper check from hair specialist.